Michelle Pfeiffer made a very rare appearance on the carpet yesterday evening(May 11th) for the premiere of 'The Wizard of Lies' at the Museum of Modern Art in New York. 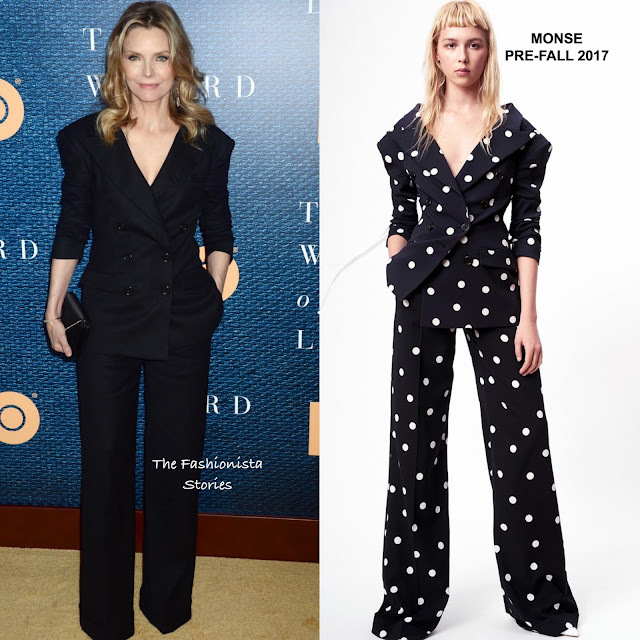 Working a on trend power suit look, she wore a MONSE PRE-FALL 2017 black two-piece in which rolled the sleeves on the jacket and utilized the pockets on her cuff leg trousers. The suit was featured in polk dot in the look book version but Michelle looked great in the black. This suit was tailored perfectly on her from top to bottom and I just love this chic look. She finished up with FRED LEIGHTON jewelry, a JUDITH LEIBER clutch, center part layered tresses and a pink lip.